A proposed new railway could bring more industry and jobs to Lapland — but it could also wreck Europe’s last great wilderness and spell the end of the traditional reindeer-herding life of the Sami people. Tom Wall and the photographer Joel Redman produced an excellent report for Guardian Weekend (which I’ve only just got round to reading because I was busy the Saturday it appeared — February 23). The Stopping Places by Damian Le Bas (Chatto & Windus), which I mentioned recently, was reviewed last weekend in The Observer by Tim Adams, who thought it a “lyrical, keenly researched… journey in search of authenticity”. Adams’s piece is now online. The Observer also had a review by Kate Kellaway of Notes from the Cevennes: Half a Lifetime in Provincial France by Adam Thorpe (Bloomsbury Continuum), who moved with his family to France 25 years ago and has written about it in columns for the TLS. Kellaway says it is an “affectionate, appreciative and perceptive” memoir, but one that “serves as a corrective to unchecked dreams of living in France”. Nick Hunt’s Where the Wild Winds Are (Nicholas Brealey) was one of my favourite travel books of 2017 and one my fellow judges and I short-listed for Stanford Dolman Travel Book of the Year. It’s now out in paperback and, courtesy of the author and his publishers, you can read an extract here on Deskbound Traveller. My review of The Debatable Land by Graham Robb (Picador), a fascinating book about a territory that once lay between Scotland and England but was part of neither, appeared in print in The Daily Telegraph last weekend but isn’t online. The Telegraph, for some reason, no longer puts much of its literary material into cyberspace, but you can read the review here on Deskbound Traveller. Iain Sinclair’s The Last London, which has been promoted as his farewell to a city whose streets he has tramped and written about for 50 years, has just been published in the United States. To mark the occasion, the Los Angeles Review of Books has “An A-Z of Iain Sinclair” that’s entertaining while being educational about the man’s way of working. 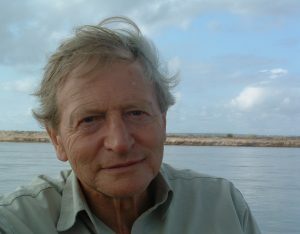 It was written by Geoff Nicholson, who, like Sinclair, has made good use of the London A-Z street atlas while researching both fiction and non-fiction. For two years I never went to school. Instead, I fed the pigs their daily slops, hunted for hens’ eggs in the nettle beds and learned to milk the cows by hand, leaning my forehead against their warm flanks while swallows twittered in the rafters and the pail foamed white between my knees… It was, I suppose, an unhappy time for an eight-year-old, alone and far from home, but its magic haunts me still… Hardship there was, heartache and cruelty, but beauty and wonder, too, and the awakening of a love of all things wild that has stayed with me to this day. That love is evident in every piece in Wild About Britain — whether Jackman is in search of the spirit of Laurie Lee in the Cotswolds or watching an otter in Shetland; whether he is introducing us to his favourite corner of Dorset (“a rumpled, tumbling green-gold land of secret combes and sensuously rounded plum-pudding hills”), or striving to understand the single-mindedness of one of his angler mates in pursuit of roach (“A trio of mute swans float past like icebergs in the swirling current, and my mind drifts with them.”). Many of the pieces appeared first in The Daily Telegraph, and some of them I read before they appeared in print. They never needed editing, just breathing on. My favourite piece in the book is one that embraces two of Jackman’s greatest passions: Cornwall and peregrine falcons. You can read it here on Deskbound Traveller. Then you really ought to buy the book. I’ve never been to the Faroe Islands, those 18 final stepping stones of northern Europe. If I don’t make it there this year, I’ll certainly read The Brahmadells, which according to Joel Pinckney, an intern at The Paris Review, is “a captivating and enlightening immersion into [the] place”. The novel, by Jóanes Nielsen, is one of the first books to be translated into English from Faroese. Pinckney says it “tells a story both intimate, tracing the complex familial legacy of the Brahmadells and other families over several generations, and general, weaving historical documents and characters into its narrative thread”. He interviewed the American translator, Kerri Pierce, for The Paris Review website. You can read a brief extract from the novel itself on the site of the American publisher, Open Letter.